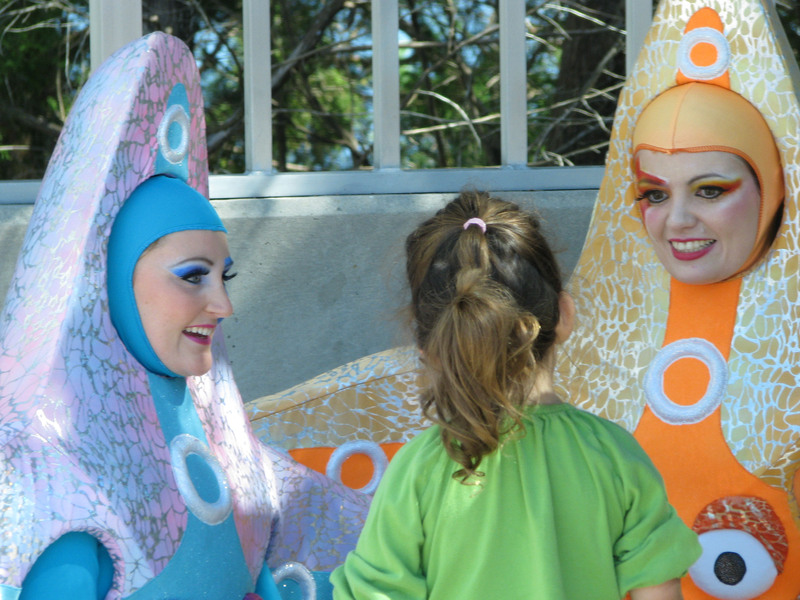 Last weekend we enjoyed the fall family fun that is SeaWorld Spooktacular! From trick-or-treating along the shore, to Halloween themed shows and entertainment, Spooktacular is a Boo-tiful thing to our family (and it’s included with park admission!). Spooktacular takes place weekends throughout the entire month of October, from 12 – 8 p.m. 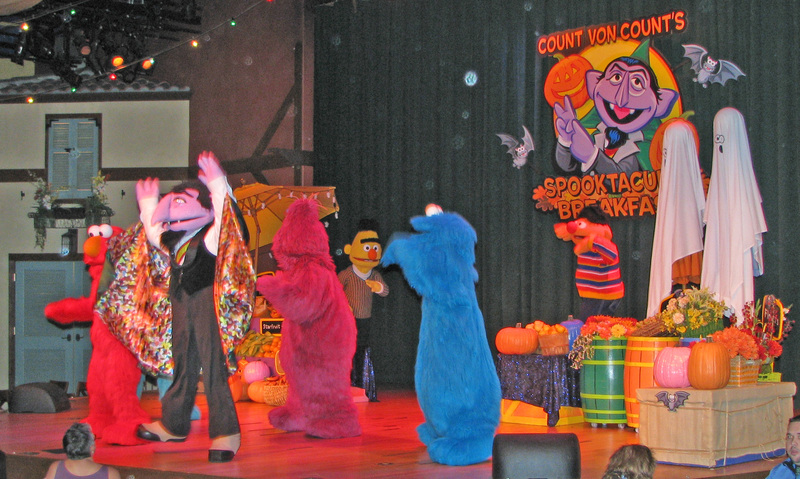 The Sesame Street Countdown to Halloween show at the Seaport Theater, is a family fave. Human host Jamie interacts with the cutest monsters around for a not-scary-at-all musical good time. I especially love The Count (ahh ahh ahh!) and Transylvania 1 – 2 – 3 – 4 – 5. It’s a play on the Big Band classic Pennsylvania 6-500. 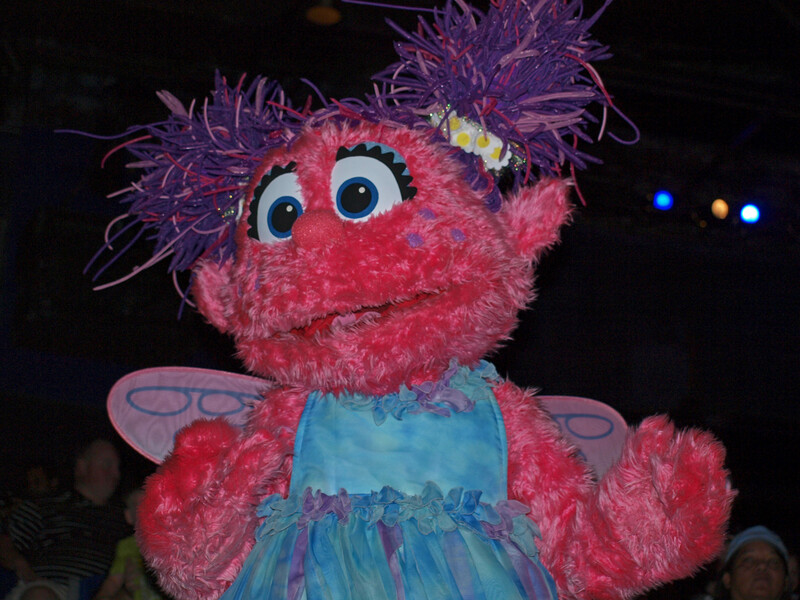 Kids of all ages will be singing along with Elmo, Telly Monster, Abby Cadabby and all their Sesame Street friends. New this year is the Dine With Shamu Halloween Spooktacular Brunch (added item, not included in admission). Enjoy a delicious menu of seasonal items while sitting at a reserved table that brings you up close to majestic killer whales and Halloween surprises — a family photo with a Halloween Spooktacular frame, a free cookie decorating kit and a trick-or-treat bag with goodies. Pass members, buy your tickets through the pass member portal for discount admission. 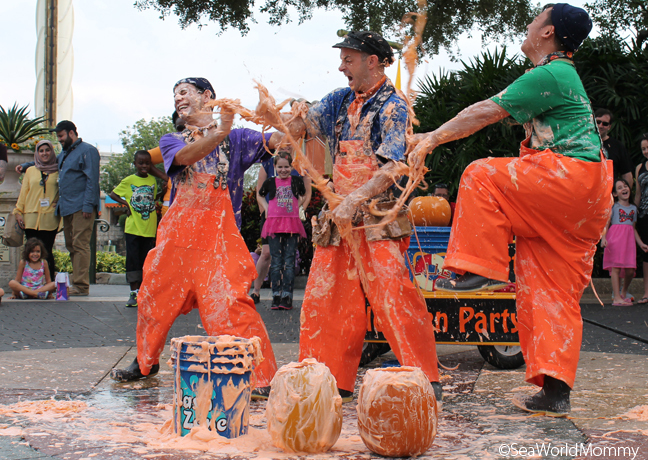 Every year we enjoy The Longshoremen doing their “Pumpkin Guts” routine. 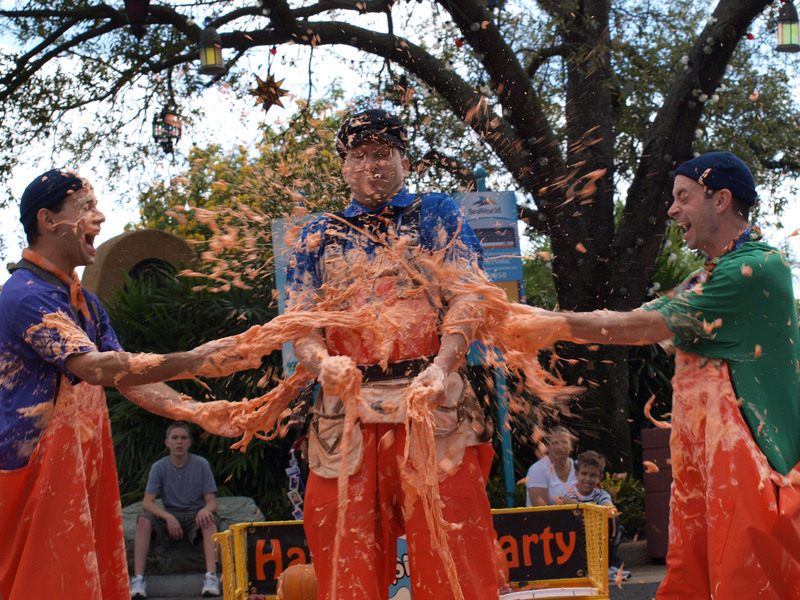 Set just outside the SeaFire Inn restaurant, the performance staring an amazing and talented comedic trio will have you busting a gut (pun intended) as they try to scoop out the pumpkin guts to carve them. Spoiler Alert: They don’t have much success at anything but making a MESS! Down at Penelope’s Party Zone, kids can get creative at the Jo-Ann CraftZone or dance to the live DJ’s family-friendly tunes. Though my son HAS the Turtle Trek app at home, he enjoyed playing on the huge screen, while his little friend made a picture at the coloring desks. Walking down and up from the party zone, big AND little kids couldn’t help but stop and push the buttons that make water dance out in the bay. Every detail has been thought of, and guests will be amazed at how much they’re immersed into the sea-themed magic all around. 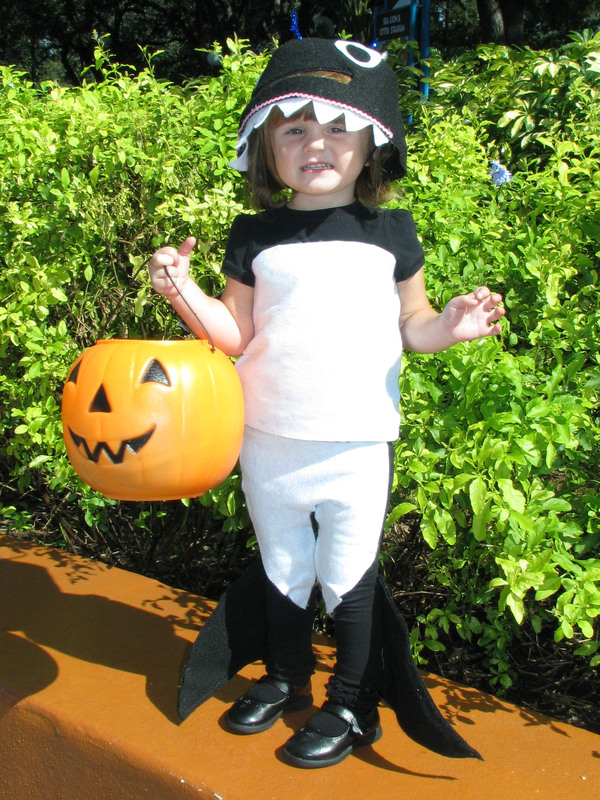 Whether you’re there for the treats or entertainment, you’ll have a boo-tiful experience at SeaWorld Spooktacular. See you there this weekend! And the next. And EVERY weekend in October! Ticket deal: For a limited time, parents can get 50% off an Annual Pass for kids 9 and under with the purchase of a full-paid Annual Pass. For more details and to purchase, visit SeaWorldOrlando.com. Preschoolers can enjoy all of 2012 for Free! Children age 5 and younger get into SeaWorld AND Busch Gardens for all of 2012 for free! The Preschool Pass is good for unlimited admission with NO blackout dates the entire year. Every special event is included. Every festival. All of it! Click HERE to sign up. Our resident preschooler is looking forward to the “Just for Kids!” festival featuring concerts by Lazy Town, Max & Ruby, the Doodlebops and Choo Choo Soul, along with plenty of family-friendly fun and activities on Saturdays, Jan. 14 through Feb. 4. 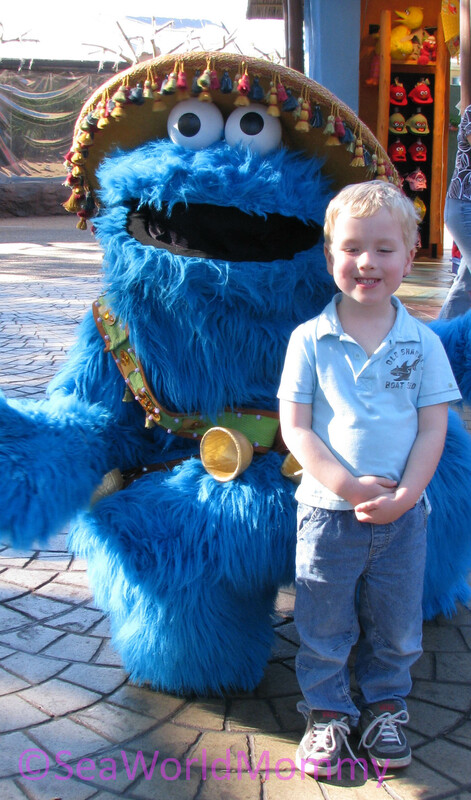 At Busch Gardens, Sesame Street Safari of Fun is ALWAYS a hit. New this year (and on our to do-list: Iceploration, premiering this February. SeaWorld’s littlest guests can enjoy the wildly popular 4-acre play area, Shamu’s Happy Harbor. It’s a kid’s dream come true, complete with kid-size rides, a 4-story net climb, and a great place for parents to relax while watching their kids have splashes of fun. The park’s first family-oriented roller coaster, “Shamu Express” can be found here along with other kiddie rides to explore. Of course no visit to SeaWorld is complete without being splashed by Shamu! SeaWorld’s newest killer whale show, “One Ocean,” features majestic whales performing spectacular behaviors, including thrilling high-energy leaps, while educating and inspiring kids and their families to make a difference in this world. And at “Blue Horizons” kids will be awed by graceful dolphins, false killer whales, a rainbow of exotic birds, and entire cast of divers and aerialists. Kid-favorite “Pets Ahoy!” will leave children giggling as a menagerie of rescued dogs, cats, birds, rats, skunks, pot-belly pigs, and other animals performing a series of uproarious and amazing skits. While older kids are flying, gliding and soaring on Manta, younger ones can experience the incredible underwater world of tropical fish and rays in the floor-to-ceiling aquariums. Manta’s underwater viewing area is home to more than 3,000 species. Kids can even “pop up” in the middle of a small aquarium, surrounding themselves with hundreds of fish for some great photos. At Dolphin Cove, kids (and parents) can touch and feed dolphins and also go below the surface for an underwater view where they just might see a dolphin blowing a bubble or two! Plus, SeaWorld features a cozy Baby Care Center located at Shamu’s Happy Harbor with top-of-the-line changing facilities, private feeding rooms and pint-sized potties. This brightly-colored building gives parents the privacy and comfort of a home-away-from home in the middle of all the fun and is a one-stop shop for baby necessities. 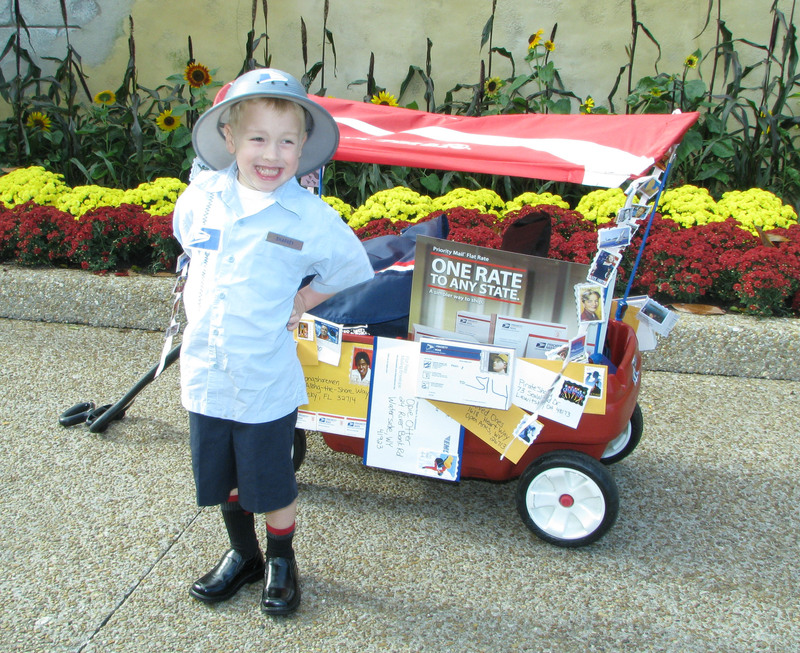 Busch Garden loves kids, too! Don’t forget this awesome new FREE Preschool Pass also includes Busch Gardens Tampa Bay. Just a short hour’s drive away, in addition to all the wondrous animal encounters at Busch Gardens Tampa Bay, preschoolers will delight in Sesame Street Safari of Fun, a sunny funny play land, filled with moments that your family can share for the first time — like a first coaster experience aboard Air Grover. And everyday smiles can be repeated time after time —clapping along to original shows, splashing in our expansive water play area and enjoying kid-size rides. The Free SeaWorld and Busch Gardens Preschool Pass is an exclusive online offer, available at SeaWorldOrlando.com or BuschGardensTampaBay.com. It is exclusively for Florida residents ages 5 and younger and is valid for unlimited admission – with no blackout dates – through Dec. 31, 2012 at SeaWorld Orlando and Busch Gardens Tampa Bay. The Preschool Pass does not include parking or Premium Passport discounts or benefits. After registering through either park’s website, registrants can pick up the Preschool Pass for their child by bringing a printed confirmation and a certified copy of the child’s birth certificate to any ticket window at SeaWorld’s or Busch Gardens’ front gate. SeaWorld Spooktacular is a tradition for our family. Since it’s held every weekend in October, we try to make it out a few times. This year we’ve been every single weekend and there’s one more to go! To add to the festivities this year, we decided to go to the “Count Von Count’s Spooktacular Breakfast” (which is an additional charge). 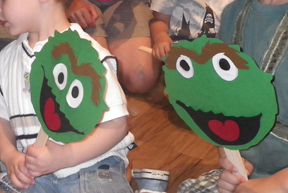 If you love the Sesame Street gang, this is a fantastic opportunity to get character photos! If you’re expecting a big show… not so much. There was a short dance number, but we missed it standing in line for food. 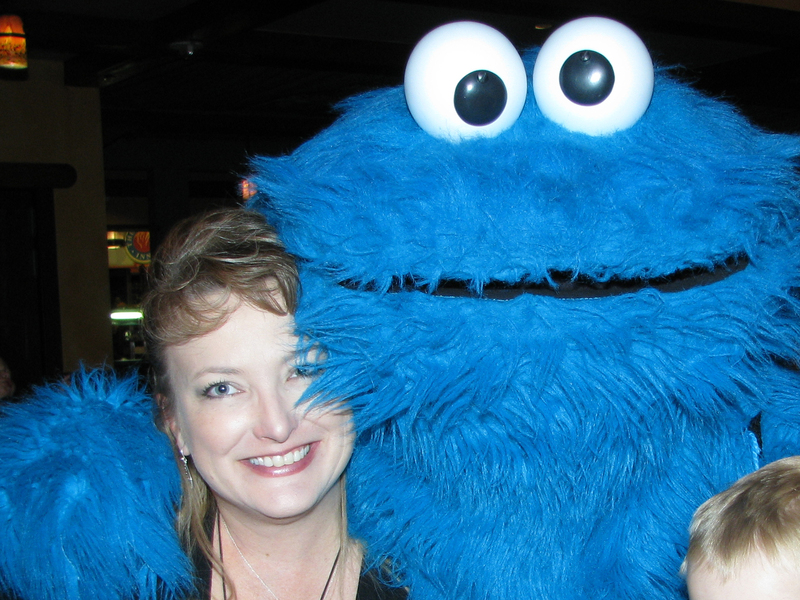 Yes, I was bummed about missing it, but I did feel pretty special getting a hug from Cookie Monster himself. 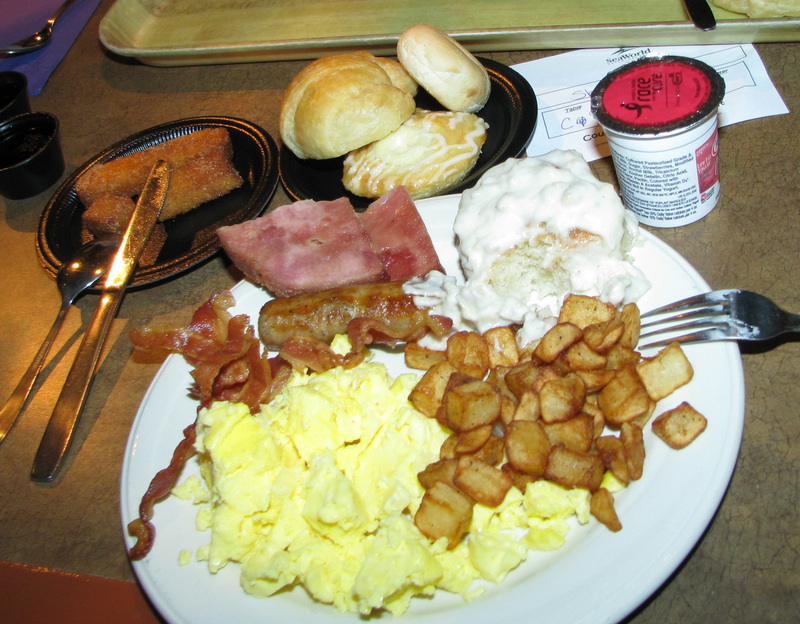 The food was typical theme-park fare, and the quantities were generous. The pumpkin guts are flying now! People watching is another favorite pastime. I especially enjoy seeing how creative people can be with their costumes. I’m particularly fond of homemade costumes, and “family costumes.” The prettiest little Shamu smiled at us this past weekend. Her mom shared how she insisted on being the adorable orca. Mom, ya done good! Families even get into the act, like the Toy Story gang. There was another little one in costume (a lamb) but, shhh, she’s sleeping! I consider myself a really creative person, and I think that’s another reason I appreciate all that’s done for Spooktacular. The characters who greet the children are wildly imaginative… And there are so many of them! Yes, it is crowded at times, but if you’re patient and either get their first or wait for a few hours to enter the Spooktacular walkway, you’ll have a great time. 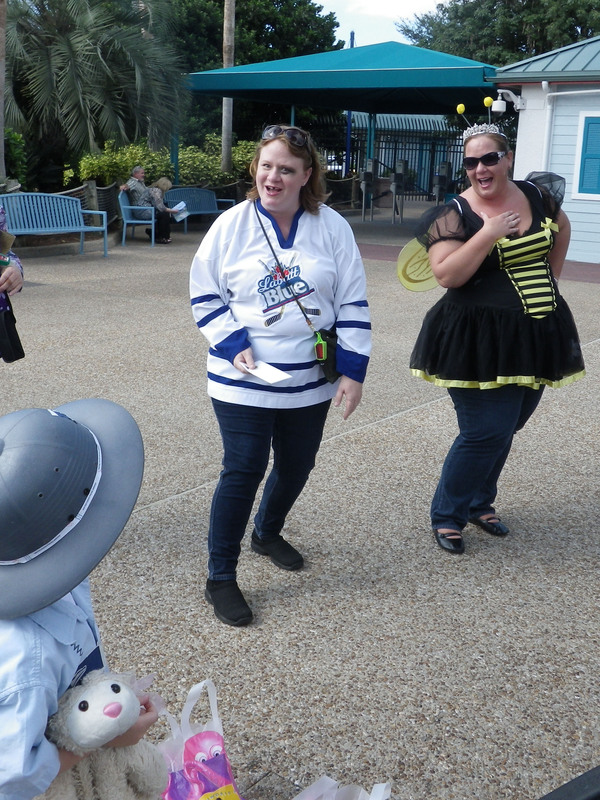 Theme Park Insider Tip: Don’t enter Spooktacular candy lane at the front entrance by the geese and Dolphin Nursery. Walk around to the other side of the park and enter from the opposite end of “Candy Lane.” The lines will be a LOT shorter! A sure-fire hit with the kids is “Countdown to Halloween,” in the Pets Ahoy Theater. Abby, Elmo, and of course The Count will dance and sing to seasonal favorites like “Monster Mash.” It’s a graveyard smash! So grab your cutest costume, or wear plain clothes… they don’t mind… and get to the last weekend of Spooktacular 2011. Even big kids with no kids of their own are welcome to dress up, trick-or-treat, watch shows and pretend they haven’t grown up… not yet, anyway! I know I haven’t! Nothing Spooky about this Friendly Witch! Now through the end of October, kids get in for half-price at SeaWorld*. With each full-paid adult ticket, a child’s ticket (kids 3-9) can be purchased for half price and you both also get to enjoy the “second visit free” promotional with the discount. Additional children get $10 off their admission. Just in time for SeaWorld’s Halloween Spooktacular! 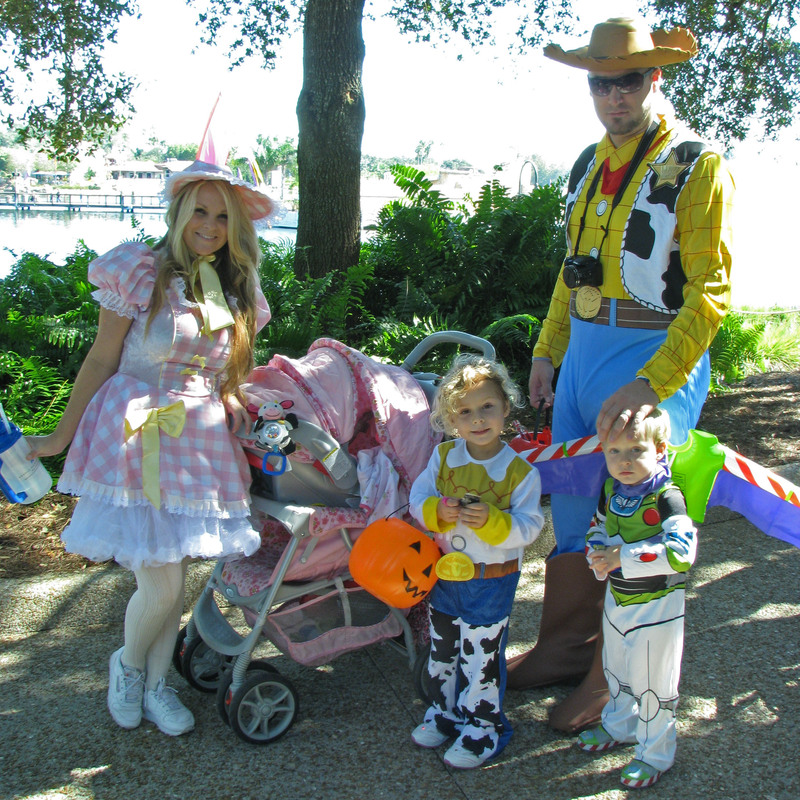 Guests enjoy trick-or-treating by the water side, and Halloween-themed shows throughout the park. 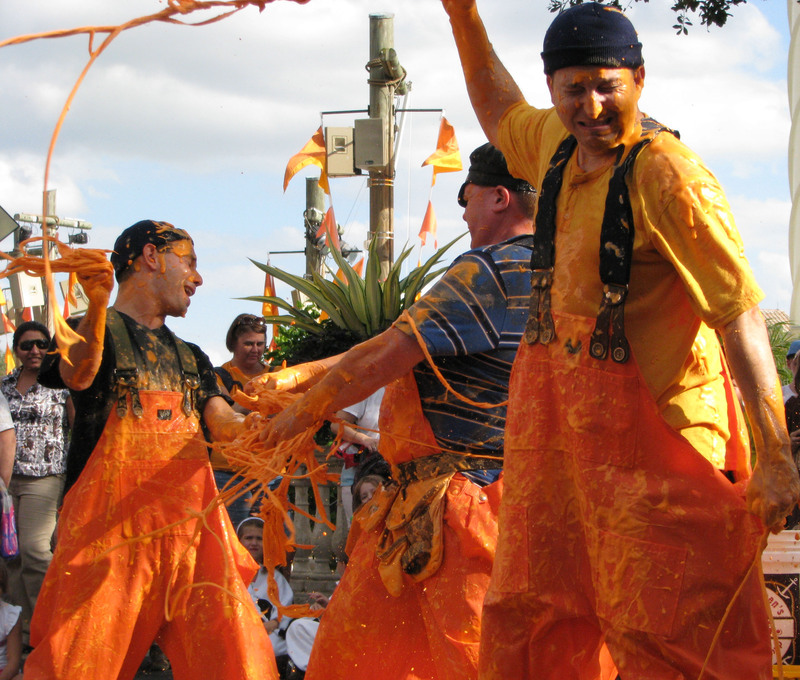 Clyde and Seamore tend to go all out and street performers, like the Longshoremen, will make you laugh with their take on apple bobbing and pumpkin carving. Longshoremen Remove the "Pumpkin Guts." Here’s a peek at the “Halloween Party” routine. I suggest when you see it live giving the stevedores some “room” to do the show. It is a splash zone. A pumpkin-spraying, arms-waving, guts flying good time. 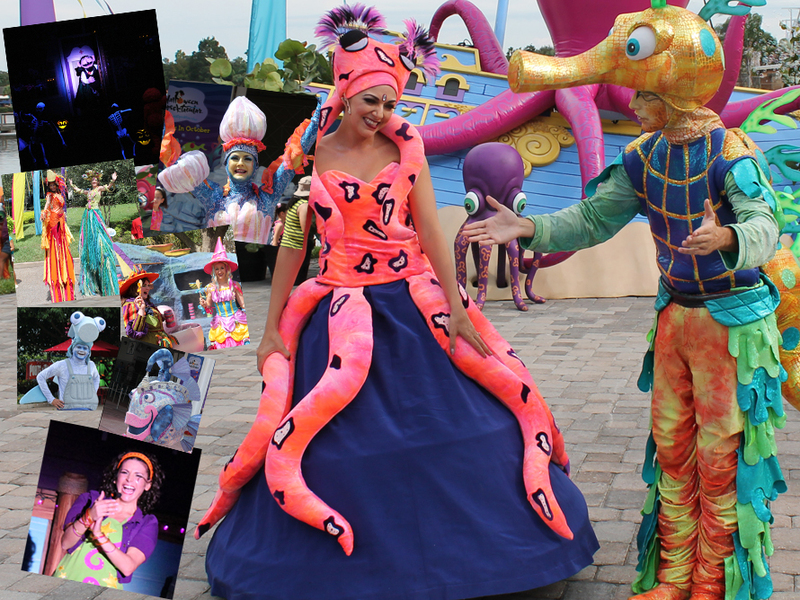 Be sure to bring your camera as there are lots and lots of great shows, and whimsical sea creatures all around who are more than happy to take pictures with your little one. (And grownups, too!) Shamu, Opie Otter, Daisy Dolphin and the rest of the characters can also be seen out and about posing in their costumes. There are even some mermaids “swimming” about. I wonder what Shamu will be this year?! 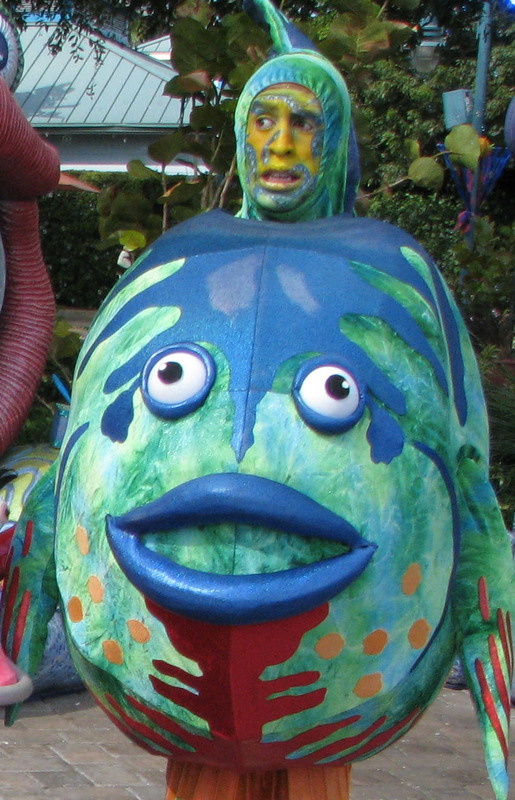 I see something fishy at Spooktacular! My favorite from last year was a little girl dressed as a jellyfish. What are your kids wearing? Any awesome marine-inspired costumes? Tell me how you enjoyed Spooktacular last year. Anyone help Abby find her wand? Did you see the roller-blade-wearing sea weed? What was your favorite part? I’d love to hear from you! *Adult admission is $81.99 plus tax, and children’s half-off admission is $36.99 plus tax with each paid-adult ticket. Visit SeaWorldOrlando.com or call 1-888-800-5447 to purchase tickets. Oscar the Grouch is not one of the performers in the Busch Gardens Safari of Fun Sunny Day Theater (there’s something in his contract about personal appearances, LOL). That didn’t, however, stop us from making him the STAR of my son’s 4th birthday party. Our invitations told everyone that, in Oscar’s opinion, the party was his “cup of mud.” And it was. And how could he not be thrilled at all the garbage trucks, disgusting sounding (not tasting!) foods, and trashy games? My son decided Slimey the Worm should be next to Oscar, crawling into the wheel. On the menu were Messy Meatballs, Dirty Rice, Filthy Fondue, Oscar Green Guacamole, Trashy Tortilla Chips, Sloppy Joes, Green Goopy Salsa Verde, and Can-D. (Get it?! In the trash can… Candy!) 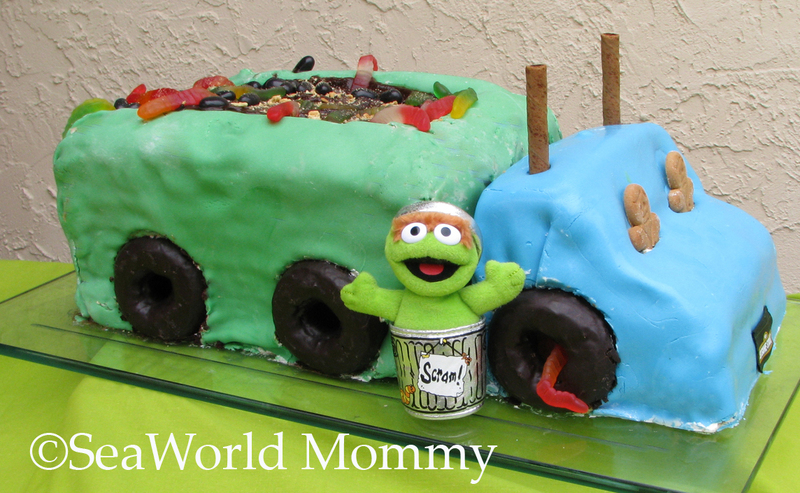 The cake was a recycling truck with donuts for wheels, ginger bread men for drivers, Pepperidge Farm Pirouettes as exhaust pipes, and of course chocolate pudding in the back with crumbled up Oreos and graham crackers for dirt with gummy worms. Game time was a lot of fun, as we borrowed some bins from our town’s recycling center. We put three labeled bins on each end of the “playing field.” One of each: metal, plastic, paper. In the center of the yard we had two bins facing each other, one green, one orange. Team orange lined up behind their bin, and green did likewise. These bins had various recycling items inside for team members to sort. (Hint: If you use metal soda cans, cut circles of construction paper slightly smaller than the can top and securely hot glue them on, so as not to have a cutting hazard from the sharp opening.) Each child grabbed an item and ran to the “end zone” where a referee was on hand to point to the right bin, as many of the kids couldn’t read the words yet! After a successful dunk, they ran back and tagged the team bin, and the next child would be off to recycle! On a side note: We’re on a first-name basis with all of our city environmental services personnel. They are the nicest guys and wave at my son every single day they’re there. We bake cookies for them on special occasions and they couldn’t be kinder to our family. Show some love to your trash men: Baked goods or cold water on a hot day. The Busch Gardens party cost is $49.95 plus tax which includes invitations, decorations, party favors, package pickup for presents and special treatment with some very special monsters. Guests who are Passport members are $23 per person. They also have a Birthday add-on for people who are already attending a “Dine with Elmo and Friends” event. 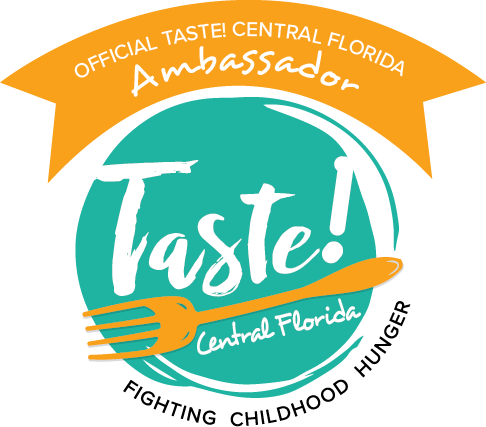 (The Dine with Elmo breakfast is $18 for adults and $13 for 3- to 9-year-olds. Lunch with Elmo and the gang will cost $22 for adults and $15 for children (ages 3-9). The add-on is a single charge that will provide your party with reserved seating, a cake, and a special birthday wish from the cast during the dine. Say, I wonder if an adult can have their birthday party there? I’m over the preschool age—not saying HOW over!—but I STILL love those monsters.